Chris and I decided to stay with Dave and Heather out at their camper for the weekend. The weather was supposed to be perfect and we wanted to get away from the house. With our upcoming travels we would not be getting back out to the lake until Labor Day weekend. 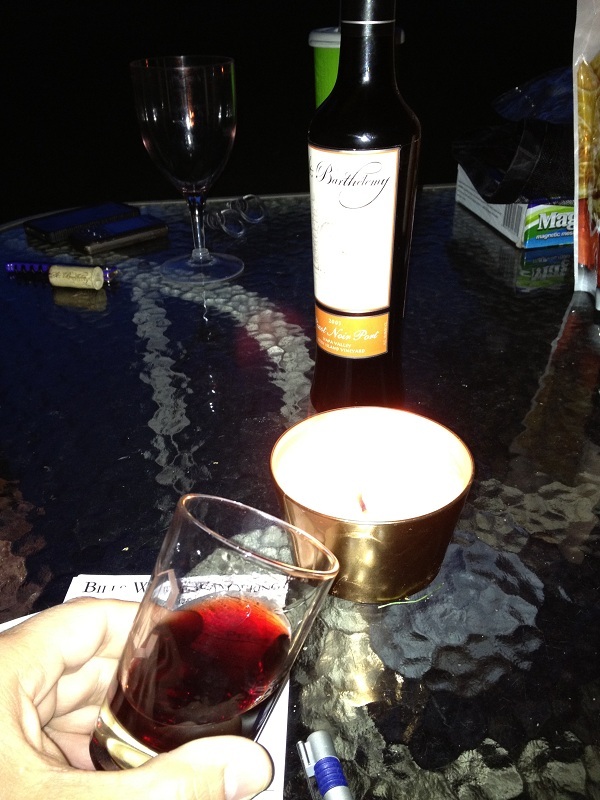 Dave and I talked earlier in the week and had decided what kind of wine we would have. Dave also wanted to bring a bottle of his St Barthelemy Pinot Noir Port that he bought back in May when we were traveling together in Napa. Dave was extremely happy when he was able to visit St Barthelemy during that trip. His main goal during our trip was to try as many ports as he could. When we discovered St Barthelemy only produces Port this winery moved directly to the top of his “Must Visit” list. He made a call and reserved his private tasting. I knew right away that Dave would return a member of the “Porte Au Vin Wine Club” and when he and Heather returned from their tasting he had six bottles in hand and a big smile on his face. HE was a new member! We enjoyed a nice steak dinner and were winding down with the evening. A nice fire was burning and we were sitting at the table talking about “life” and discussing our kids. 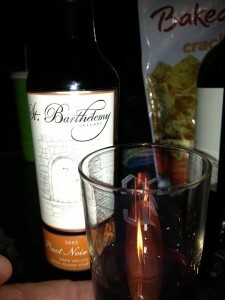 We were done drinking our wine and it was time to try the 2003 St Barthelemy Pinot Noir Port Dave was sharing. 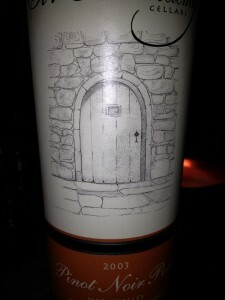 I was anxious to try it because in the past I had enjoyed Tawny, Ruby and Cabernet Sauvignon Ports. Here are our tasting notes. The color depth was medium to deep. The hue was a nice Ruby and the clarity was very clear. The Pinot Noir Port was very aromatic. Even sitting outside! I think the predominant aroma was Raisins. As we tasted the Port it was sweet as one would suspect. 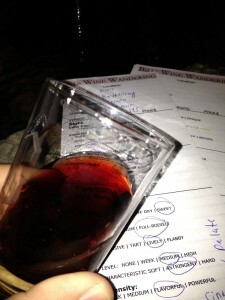 The port was full bodied and the tannin’s were medium and were felt on the sides of our palate. The port was very flavorful. We could taste Raisins, Vanilla, Cinnamon, Apple Pie, and Cranberry. The flavors were excellent! The finish was very long. Reading the St Barthelemy website I see they offer various Port varietals. I am looking forward to trying the others with Dave. I have also asked Dave to add some bottles within his upcoming order for me! The price of the port is an excellent value. If you are a fan of port I would contact St Barthelemy and either join the club or buy a few bottles for your cellar.